The number of people killed when a coach plunged off the Pan-American Highway in Peru has risen to 44. The bus veered off the road in a curve and plummeted 100m (330ft) down a rocky river bank. 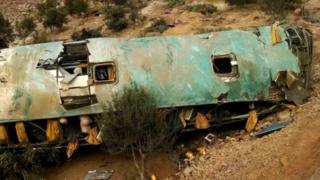 The accident happened in the early hours of Wednesday near the Ocoña bridge in southern Arequipa province. Emergency workers retrieved 43 bodies and one victim died later in hospital. Last month, 52 people died when another coach fell down a cliff in Peru. More than 20 people were injured in Wednesday's accident. The double-decker coach from the Rey Latino company was taking passengers from the town of Chala to the city of Arequipa, 400km (250 miles) away, when it came off the road. The cause of the accident is not yet known but Rey Latino has been suspended for 90 days while investigations are under way. Peru's President Pedro Pablo Kuczynski expressed his condolences to the relatives of those killed in a tweet [in Spanish]. The accident comes seven weeks after another deadly accident on the Pan-American Highway north of the capital, Lima. In that case, a lorry driver clipped a coach, causing the latter to veer off the road and down a steep cliff. Local media reported that the Pan-American Highway was the road with the second highest number of accidents in Peru last year. Long stretches of the highway, which winds along the Pacific Ocean, do not have a guard rail and there is often a sheer drop.